Bayside Bull specializes in real open pit sandwiches in Edgewater, Maryland. Check out our Catering and Carry-out Menus below! At graduations, backyard BBQs and even weddings. Bring Bayside to your event. sliced thin and piled high, and served on a fresh baked roll. Below are the current menus at our Edgewater, MD store. 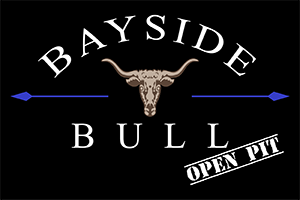 Bayside Bull began in 1982 as Rick’s Baltimore Bull, Open Pit Beef in Crofton, MD. Over the years, Bayside Bull has thrived on a constantly growing catering business, specializing in Bull Roasts, Company Picnics, Private Parties, Weddings, Customer Appreciations, Open Houses, Holiday Parties, and A-La-Carte Platters for all occasions. From fancy and formal to backyard BBQs, we do it all! Specializing in great food and a variety of menus, Bayside Catering can provide the event you’ve been dreaming. Talk to a sales consultant today to learn more.